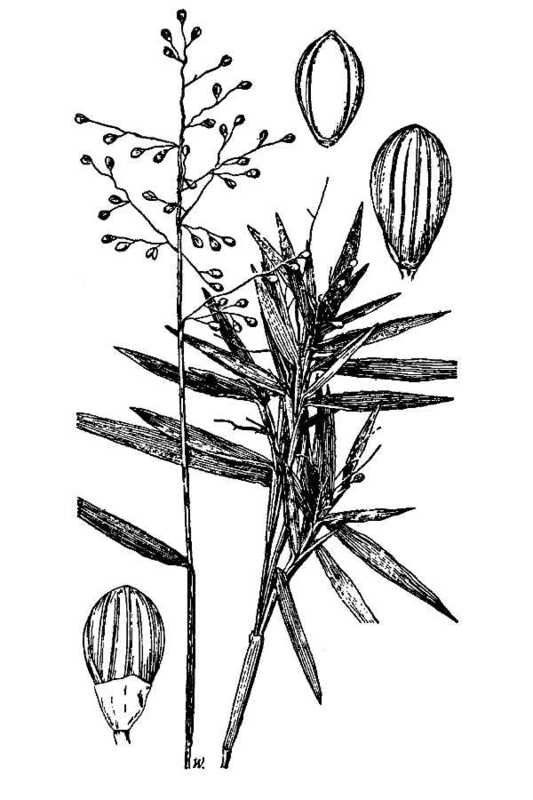 Panicum lancearium.USDA-NRCS PLANTS Database.Hitchcock, A.S. (rev. A. Chase). 1950. Manual of the grasses of the United States. USDA Miscellaneous Publication No. 200. Washington, DC. (Accessed 6/2014). Dichanthelium sabulorum var. patulum is a tufted perennial C3 grass (Aliscioni et al. 2003), hairs of two lengths long and short, mixed; spring phase 15-50 cm, stems stiff, sheaths much shorter than internodes, usually finely hairy, ligules inconspicuous. Leaves alternate 2-6 cm long (or more), 0.3-0.8 cm wide, hairy at base. autumn phase a prostrate, matted, much-branched rosette; leaves ca 3 x 0.4 cm, crowded. Flower spikelets few, about 0.2 cm sometimes finely hairy, few, 1-flowered, My-June; inflorescence diffuse, 3-6 cm; autumn inflorescences reduced, concealed by leaf sheaths, July-Nov. Seeds eaten by many birds and small mammals, plants eaten by geese and rabbits. Habitat: Dry, open areas, sand, fill, near shore, pine barrens.